The Hellenic Initiative Australia has upgraded two Paediatric Trauma Centres in regional hospitals in Greece through a new partnership with Paediatric Trauma Care (Pedtrauma). 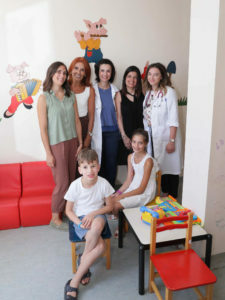 The first centre was officially opened on Friday 7 September in the northern city of Kastoria, at a ceremony attended by Dr Helen Zorbas AO, CEO of Cancer Australia and Board Member of The Hellenic Initiative Australia. Dr Helen Zorbas AO with Pedrauma Program Manager Niki Zolota and Dr Christos Lazarou at the Kastoria hospital. 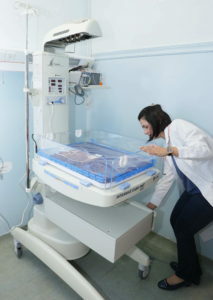 The $48,000 grant to Pedtrauma covered the purchase of key medical equipment for the Paediatric Clinics and the Neonatal Units at the General Hospital of Kastoria and the General Hospital of Ioannina, in northwestern Greece. “The Hellenic Initiative Australia is proud to be supporting Pedtrauma, which is equipping hospitals throughout Greece with the facilities to provide critical health care to children,” said Nicholas Pappas, President of The Hellenic Initiative Australia. Since 2010, Pedtrauma has spent more than €1.5 million establishing 18 Trauma Centres and upgrading 20 Paediatric Departments and Clinics in public hospitals throughout Greece. Welcoming the support from THI Australia, Pedtrauma President Natasha Clive-Vrecossis said Pedtrauma was working through a growing waitlist of urgent requests from hospitals requiring specialised medical equipment for treating child ren. By mapping and prioritising the needs of hospitals throughout Greece, Pedtrauma aims to provide access to urgent medical care for all children who are seriously injured. “If there is a serious accident, a child has to get to a hospital very quickly. This is the ‘golden hour’, the first 60 minutes that a child has to be stabilised, otherwise they can lose the battle with life very quickly,” Ms Clive-Vrecossis says. The upgrade of the Ioannina General Hospital, funded by The Hellenic Initiative Australia, will be completed in October. Founded in November 1995, Pedtrauma is a non-profit, non-governmental organization which aims to raise awareness of children’s accidents in Greece, reduce their number and severity and to improve care once an accident has occurred. Pedtrauma’s main objective is to open Trauma Centers in all the major Public Children’s Hospitals in Athens and throughout Greece. Pedtrauma also runs trauma prevention programs in schools and provides specialist paediatric trauma training for doctors. It is funded entirely by private donations.